With the overall quality of a standard AR15 increasing year after year, it’s pretty easy to slap on a free float rail, a 1-8x variable, grab some match ammo, and proudly proclaim you have a DMR (aka the designated marksman’s rifle). What is the essence of a precision build? The purpose of a DMR is to aid you, the rifleman, shoot precisely over any distance in which the cartridge performance remains practical. A DMR and its usefulness depends on the target, the environment, and wether or not the shooter can keep the bullet on target to the edge of its ballistic envelope. For training, aDMR can help you evaluate your marksmanship and if it is accurate enough, allows you to evaluate your own marksmanship without the “is it me or the rifle” type of self doubt. Without an accurate rifle, we may not be able to evaluate our own performance. How frustrating would it be to evaluate your marksmanship with a 5 moa rifle? Did your change in technique / posture result in any measurable improvement? Innacuracy masks any incremental improvements and leaves you in the dark. The configuration should, as above, be as accurate as possible to help you guage and improve your own shooting. It should also fit the criteria of a competition legal rifle to allow you to shoot under stress and maintain proficiency. My vision for a DMR build is a rifle that is both accurate and legal for marksmanship oriented competition. In this case, a High-Power legal service rifle. But wait! “Lothaen, I don’t want a rifle with lead weights and all that crap.” Bingo. Neither do I. My rifles are set up to allow legal use in such games, but lead weights are not part of my builds. A practical rifle can be High Power legal, and yet it can be more practical than the 11lb beasts the HP crowd assembles. Will your rifle be as steady on target during position shooting? Likely not, but will a HP rifle be steady on target at a run and gun match? Probably for a few minutes until their shooters arms fall off. My first HighPower rifle was capable of being used as a competition rifle… or a zombie shooter. Keep an eye toward practicality with your competition builds. The above is standardo chrome lined Gov’t Profile. A far cry from the dedicated HP rifles I competed next to. 16-20 inch barrel, flash hider OK. Cannot be larger than .750 in front of gas block. Sling swivel must be 13 inches from mag well so you need at least a 12.65 inch rail. A 4.5x optic (max) with an objective no larger than 32mm. What about Precision Rifle Series? That means that your shiny new build can fling lead legally for a variety of competitions! The rules let you paint with a pretty wide brush in your building process. For me, NRA High-Power is closer to my area so I wanted to ensure compliance with HP rules. To have the ability to compete is to allow you to evaluate your performance under the semi-narrow circumstances of a match. That means KD ranges (useful for knowing your dope), wind calls (useful for all marksmanship), fixed position / scenario shooting (standing slow fire, rapid fire prone, etc), and it’s all available to you! Hmmm what is this we have here? It’s my new primary. My plus one. She will accompany me to any and all events. She follows my philosophy of a competition ready, yet practical rifle. Working on 1-4x glass choices for HP. That’s some dang fine use of the DMR build there. All for a car drive and entry fee, you get some serious experience with your build. Build your DMR around popular match rules so you have the *option* to compete. It’s pretty easy! Don’t get hung up on building the rifle to better fit a specific type of competition. Don’t get hung up on the fact that you won’t be able to keep up with the guys shooting sponsored rigs built for one game and expensive gear. You are there for you. You are there with your rifle, to learn and improve. In time, you will rank yourself against your old self. That should speak to all shooters. This one is mine. I must master it. To master is to reach a peak. Imagine if every rifle owner had enough knowledge to engage targets up close, out far, to the peak of the rifle’s ability. One rifle which has been through courses, competitions, and which the rifleman knows its performance intimately. He knows his performance and capability intimately. He knows what he can, and can’t do. That’s the experience we should all strive for. Less collecting, more mastery. I am guilty of collecting myself. Well, since I was waxing poetic, let’s move on to the ultimate traditional rifleman topic: IRONS! Much of the industry has ditched the fixed front sight and gas block, but I’m yelling to you right now that the FSB still has many advantages on a precision build. Optics are the primary sighting system, but the ability to mount a rear sight and keep up your iron sights game is something I find attractive… and mounting the FSB to the barrel is still king. Front Sight Base is still my favorite. Sling tension on rails can shift your POA by several minutes! Rail mounted front sights shift under rail tension. The longer the rail the more leverage the environment has over its final position. Do you have a vertical foregrip? Co-witness the a red dot with your irons, and twist that foregrip. Did the dot and irons shift? Bingo. Ditch the sight on the rail and keep a railed gas block or a fixed FSB. No POI shift, tough as nails, no drama. You can practice irons and sling up without POA issues. Sure it’s a backup, but maybe I want to dust off the ye old MKI eyeball, sling up, and shoot with a irons. Not a problem with a fixed FSB. Another area the industry has moved toward is narrow rails. With the advent of key-mod and Mlok we can really slim down the rail and create a small of circumference as possible. There are several problems with long, narrow rails on a DMR build. Rail to barrel contact is a possibility when loading a bipod, using sling tension, or when mounting MLOK or KeyMod accessories. Specifically the gas block. Let’s look at my Aero Precision Atlas One rail. It’s a narrow diameter hand-guard. If you pull or push hard enough, the gas block can gently touch the rail. Sudden changes in accuracy (harmonics) can erupt from something as simple as that. Super narrow rails are ok unless your gas block just barely fits. IF that’s the case, then Mounting MLOK hardware underneath the gas block could lift it and add a huge variable to your precision rifle’s accuracy. Attach a MLOK accessory in the slot below the gas block and you can make contact with the gas block and the Mlok hardware. This occurs with the narrowest of rails with even normal sized gas blocks. My Atlas One rail is mounted to my 16 inch blaster, not my precision build. I love the rail, but I want to share the potential disadvantages of super skinny modular rails. One way to avoid this is to keep your rail behind the gas block thereby eliminating the chance that the gas block can make contact with the rail. Ergo my precision build uses a fixed front sight, mounted forward of a 12.65 inch quad-rail where there is no chance of hardware making contact with my barrel. It’s good to be back behind the keyboard. I had a long trip in Florida and it has taken a few weeks to sit down and start typing again. Next topic will be considerations between reticle types, fixed BDC vs MIL/MIL systems! Stay tuned and thanks for reading at www.thenewrifleman.com! Trouble In High Power Land: Learning ‘Bout Optics! My eyes are long past the ability to focus on the front sight. Its an optics game for me now. For that reason I don’t run back up irons. Other than that. I’m pick’n up what you’re put’n down. Absolutely understandable. I use corrective lenses for now, we will see how long I can manage irons! 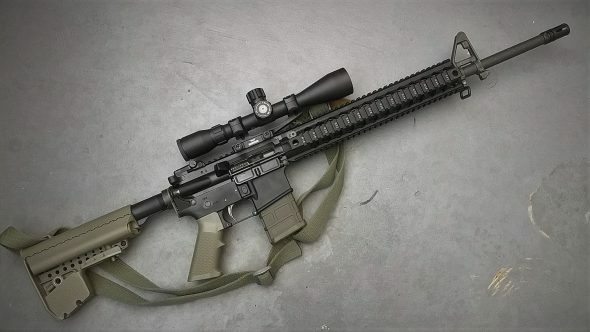 Designated Marksman Rifle. Clarified in article thanks for catching it. Is there much difference between an EMR & DMR? I have always keep my eyes on a M-39. I am pretty sure they are replacing it. The new rig looks good. Is that a free float quad rail? Yes it is, BCM QRF 12 inch rail. It’s nice. Review upcoming. Running the Aero Precision M4E1 Enhanced model with 20 inch LaRue Stealth barrel topped with Primary Arms 1-6 ACSS and she has been a nice complimentary addition. Need to find more range distance for her > than 300 yards. I do not run it near as much as the A4 with irons but as long as my eyes will hold up would prefer to keep 25-300 distance skills sharp. The DMR has helped steady my iron shots at 300 to the point I am ready to push out to 400 yards. Awesome. I will be using the carry handle for my first HP match… saving my coins for a new optic in the meantime. Good write up lothaen and nice to have you back writing articles. Lothaen, what are you thinking to run for optics on your DMR? Shopping glass for the youngest for Christmas and was looking at the PA 3x or 5x Prism scopes for his A3. Considering all options for effective use CQB to 300/400. At 3x the drops are hard to see. I would go with the 5x ACSS to give the reticle size a bit of a boost. Losing those reticles without illumination is too easy when shooting in the woods or in low light. I am eyeing the 4x ACSS Acog, but thats going to be budget wise in the future. 5x is not legal for highpower. I would note that Geissele’s rails were made stout enough to keep a laser designator zeroed to POI while someone is pressing it into a barricade/loading a bipod/tensioning up a sling. They may not be the slim ones you caution against (I haven’t held one myself), but they do address the issue you describe.